Pennsylvania's Supreme Court justices expressed skepticism and some impatience with an attorney for Erie Insurance Exchange Thursday as he repeatedly argued that a policy holder acted intentionally and not negligently — and Erie therefore didn't have to defend him from a lawsuit — when he fought and shot a man who walked in on a 2013 murder-suicide. Members of the state's highest court appeared unconvinced as Allen Molotsky, representing Erie, pointed again and again to the court's 2007 decision in Donegal Mutual Insurance Co. v. Baumhammers to argue that when Harold McCutcheon murdered his ex-wife then grabbed Richard Carly at the front door, he was setting up a series of intentional acts that meant he was exempt from coverage by his Erie homeowner's insurance policy when Carly was shot and wounded as they grappled. Meghan K. Finnerty, representing Carly, initially took exception to that characterization of the complaint, saying it had been written to lay out McCutcheon's negligent behavior in the shooting. "That was my wording, and I meant it as a compliment," Justice Todd said. Finnerty said that at worst, the complaint left it ambiguous whether the gun went off intentionally during the struggle, and when considering Erie’s duty to defend the plaintiff should be given the benefit of any ambiguity. But the court noted that the fight leading up to the gunshot could point to the kind of intent to harm that would trigger the exceptions in the Erie insurance policy. 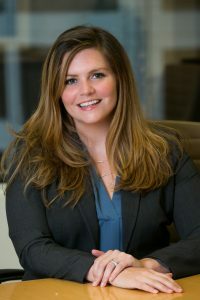 Ms. Finnerty is a commercial litigator with a varied practice, with an emphasis on assisting corporate and nonprofit policyholders as they navigate disputes with their insurance companies. Ms. Finnerty also has significant experience assisting companies in products liability and construction accident litigation. She has represented companies in fields such as energy, finance, construction, manufacturing and retail in commercial litigation disputes, and regularly serves as a sounding board for manufacturing clients on a wide variety of legal issues including, insurance losses, risk management, contractual indemnity, employee theft and collection issues.